The very origins of DOS and Windows tells you something about the way it works now. I remember reading that in the original piece of software that Microsoft was hired to write, BASIC for the original IBM PC, one of the most difficult tasks was to get the interpreter to fit into the memory they had available in the machine's ROM. We're talking very primitive hardware here, and quite the engineering feat to work within those constraints. One of their decisions speaks volumes about the philosophy that suffuses much of Microsoft software today. Because memory was so tight, they couldn't afford the number of bytes to print the traditional "READY>" on the screen, so they chose "Ok>" instead. If any of you remember using the BASIC built-in to the original PC, you'll remember that "Ok>" prompt. Why say anything at all? If resources were tight, why not just provide a simple prompt when everything is OK? Like ">"? This is exactly what the Unix guys did when they needed to be frugal with resources -- they invented the idea that "no news is good news". Take this simple distinction, "Ok" vs. "Silence", and multiply it by millions of lines of code and decades of development. What you end up with is the most annoyingly chatty software you can imagine, Windows and Office. They constantly pester me about things I don't care about ("You have un-used icons on your desktop", "You're network cable is unplugged", "Let me go harvest clip-art from the Internet for you", etc.). An alternative is Mac OS X, which is sublimely quiet most of the time, and of course command-line Unix which is positively mute (until it needs to tell you something that you really need to know). Obviously, chatty software annoys me (I've blogged about shortcuts to turn off some of the annoying balloons in Windows before). But I had never thought about why it is that way until I remembered that, when given the choice between silence and verbosity, Bill and Paul chose the latter. Friends and family, when they discover that I've written several technical books, ask me if I ever plan to write a novel. My stock response to that is "No! -- Writing a novel would be much more difficult for me, because in technical writing you just describe stuff, whereas in a novel, you have to create an entire internally consistent universe from whole cloth.". Which makes Christopher Judd's Bearable Moments such a remarkable achievement. I've known Chris for years, and he's written a couple of fine technical books (Pro Eclipse JST: Plug-ins for J2EE Development and Enterprise Java Development on a Budget: Leveraging Java Open Source Technologies. Now, he's written his first children's book, Bearable Moments. One of the most daunting tasks facing any writer (no matter what the genre) is understanding and empathizing with the intended audience. To me, that makes writing a children's book one of the toughest jobs a writer can face. Hat's off to Chris -- I hope his venture into non-technical publishing garners him the accolades he deserves. At ApacheCon last week, I finally met some developers for whom I have great respect: Ted Husted, Craig McClanahan, and one of the original authors of WebWork (unfortunately, I didn't get his name). It was nice to finally meet these guys, even if it was during a train wreck. About the wreck in a second, but first why I can talk about said wreck. I have no small insight into the web framework world -- I did after all write a book just over 2 years ago (Art of Java Web Development) featuring Struts (the King of the Castle at that time), Tapestry, and WebWork. I think my crystal ball wasn't bad for those 3 particular frameworks. I've been giving conference talks on framework comparisons since the book came out, as well as conducting some Birds of a Feather sessions on web frameworks. All this credentializes me in the web framework space. I bring this up for 2 reasons. First, I think the original Struts succeeded in no small part because it was simple. If you knew how request-response worked, and you knew a few design patterns, you could figure out most of Struts in about a day. Meanwhile, the competition (Tapestry, Turbine, WebWork) were a bit more complex. This is back in the day when people weren't even sure you needed a web framework -- most people were just rolling their own. Along came Struts, which managed to hit the sweet spot of solving some problems without being too big or complex. If you spend some time with them, I think that WebWork and Tapestry are better conceived frameworks (with totally opposite approaches). Note that this was a million years before Ruby on Rails was even a glint in DHH's eyes. The second reason I bring this up was because I found myself in a Birds of a Feather session on Struts at ApacheCon. And my distinct impression was that of moving deck chairs on the Titanic. The big news of late, of course, is the merging of WebWork into Struts. But, at the same time, the Shale extension of Struts is rolling right along. There was a great deal of discussion about how to manage to reconcile these two fundamentally different paths (action framework vs. component framework). And, unfortunately, all these efforts apparently will appear under the Struts name. I understand the software geek drive to always reach higher and further. But I think you also need objective perspective about what you've created. Based on my observations, the Struts team has completely lost that perspective. My solution? Keep Struts right where it is, a nice simple web framework with very low barrier to entry. Go ahead and enhance WebWork (and call it WebWork), and go ahead and work on Shale (and call it Shale). Trying to make Struts into an integration platform with lots of complex moving parts kills the one thing that Struts truly has going for it: simplicity in the face of ever growing complexity in the web framework space. For the polar opposite of simplicity, see Faces, JavaServer. About 6 months ago, I submitted several abstracts to ApacheCon, and two were chosen. The first was cross-language Regular Expressions, which is no big surprise, given my history with that topic. The other selection surprised me: Ruby for Java Developers. This is a talk I have prepared for No Fluff, Just Stuff, but never had a chance to deliver it (you don't get to do Ruby talks when at the same conference as Dave Thomas, nor would I want to). During the interim, Ruby has gathered even more steam, so I was anxious to give this talk and see what kind of interest was present. I talked to several people over lunch about Ruby, and everyone I talked to at the conference said they were interested my talk. The appointed time arrived, and I wasn't disappointed. They booked it in the large keynote room, and I had over 100 people for the talk. I had to rush a bit because I had too much material (I'm sure those of you who know me will be shocked by that), but the talk turned out really well. I ran up to and slightly into the afternoon coffee break, so I made the offer for people to stick around and ask questions after the talk. I had about 10 people come up and ask me about various aspects of Ruby, and everyone was interested and engaged. I've been positioning myself both within ThoughtWorks and externally as a pragmatist on Ruby. I really like Ruby, but I'm not ready to sell the farm on more mainstream languages yet. Ruby has tremendous potential, but there are still hard problems to be solved in Ruby before it can storm the castle walls of Java and .NET. I fully believe that those problems will fall (and I think ThoughtWorks will solve many of them, just as we solved problems in Java and .NET). Of all the candidates for "Next Big Thing", Ruby is the clear, ahead of the pack contender. I don't really understand the weird fetishization of celebrity in the US. It seems that everyone wants to meet someone famous and get a piece of them. What's up with autographs? What does it mean that you got someone you admire to sign a piece of paper? I understand the desire to meet and talk to the people I admire. But, going up to a famous person and being able to enter a real conversation with them is absolutely impossible. Because nuts stalk famous people, they must always be on their guard. Because I feel this way, I have never approached anyone to shake their hand or get an autograph -- it's utterly meaningless. Besides, there are very few people in the world whos stature I would consider worthy of an autograph. I almost walked over one of them a couple of weeks ago. During my last trip to San Francisco, my friend Terry and I went to Beethoven's opera Fidelio. Terry was calling home, so I was walking around the beautiful opera house. As I rounded a corner, I came upon a really elaborate wheel chair. I thought to myself "Wow, that's a really elaborate Stehen-Hawking-style wheel chair". Then I walked around the front and nearly bumped into...Stephen Hawking! I remembered reading that he was in town lecturing in San Jose while I was in San Francisco. Of course, even if I wanted to get something silly like an autograph, his advanced state of Lou Gerhig's disease would make it cumbersome. As much as I'm not star struck, it was a little amazing to be so close to such a great man. If ever there was someone worthy of adoration, I would vote for him long before the pop star of the week. I hope he enjoyed the opera! The last No Fluff, Just Stuff show of the year just wrapped up a few weeks ago in Denver. My travel schedule has been pretty brutal lately (in fact, I spent the week between No Fluff Dallas and No Fluff Denver at another conference in San Francisco), so in a way I'm glad that my weekend travel is winding down for the year (just one more conference for the rest of the year, ApacheCon). I was surprised, though, at how much I dreaded the end of the show in Denver. I've made real friends with speakers on the tour this year, and the propect of not seeing any of them for 3 or 4 months affected me more than I thought it would. When you do a series like this, you end up taking for granted many of the less obvious features, like when you will see your friends again. Then, the series is over for the year, and there is no upcoming event. This has been a great year for me at No Fluff. I ended up doing 14 shows this year, several more than I had planned, but I'm certainly glad I did. I've blogged about the extraordinary level of attendees before, and they help make the weekend fly by. But the other thing that drives me from my home for a dozen+ weekends a year is the chance to get to hang out with the other speakers. Robert Sherwood, reviewing cowboy hero Tom Mix: "They say he rides as if he’s part of the horse, but they don’t say which part." Dorothy Parker: "That woman speaks eighteen languages and can’t say ‘no’ in any of them." George S. Kaufman: Once when asked by a press agent, "How do I get my leading lady’s name into your newspaper?" Kaufman replied, "Shoot her." No Fluff has created a geek version of this same phenomenom: the speaker's dinner. On Saturday night, the speakers go somewhere and eat, and every one of those gatherings ends up being the most fascinating coversation you can imagine. All these brilliant guys, gathered to talk about what they've been thinking about all week that they can't discuss with their spouse. I've had more revelations over food during the last year than I probably had my entire life leading up to this year. So, while I'm glad to spend some time at home, I can't wait for the next gathering of the No Fluff Round Table next year -- I'm sure that we will all have several months worth of pent-up discussion just waiting. In my last Technology Snake Oil posting (Part 5: The Integration Myth), I talked about the more and more comprehensive IDE's and the bundling together of more and more tools. I think that Microsoft Office and Visual Studio point to a disturbing, Borg-like trend. It doesn’t matter if none of the tools is the very best at what it does, as long as it works nicely with all the other tools in the suite. The problem we have in the development world is that we are drowning in tools. The “bit rot” problem in Windows is well known. The more software you install, the more likely there will be conflicts between components, the slower it gets, and the flakiness level rises. I reached an interesting milestone recently. I had the opportunity to build my development laptop completely from scratch (no ghost images, everything installed in pristine state from CD's). Anticipating this momentous occasion, I compiled a list of all the tools that I thought I couldn't live without. Many of these tools are very special purpose (like WinMerge), many of them are open source, but they are all tools that I use, maybe not daily, but at least sometimes. Once I got everything installed, I started getting the kind of flaky behavior symptomatic of a bit-rotted Windows machine. I had reached a milestone: my basic working set is incompatible with Windows. This led me to pare way down on the tools I use. Every tool has to defend its life, and make the cut to survive. I gave up some stand-alone editors (I have a text editor fetish, and formerly had a bunch of them, each for one or two things they did really well). Most of those chores have moved over to Emacs now. OK, and Notepadd++. And Crimson Editor. But that's it! I promise! I’ve been actively trying to cut down my working set. Developers love software, and tend to accumulate a lot of it. In the pathological case, developers can spend more time installing, uninstalling, and trying to get integrations working between tools that they have no time left for productive work. I have to fight this tendency in myself to try new tools, because each one represents a shiny new object that will, according to its web site, be faster, lighter, more aerodynamic, and brighter, a floor wax and a dessert topping. Using an over-worn analogy, we have an entire wood working shop filled with expensive, gasoline powered, multi-purpose saw/drill/lathe/turnip twaddlers. Instead of monolithic tools, we need very cohesive, modular tools. The Unix guys got it exactly right – create simple command line tools that follow a few conventions (like all input and output it unadorned text). They created independent, cohesive modules of behavior. Once you understand how these modules work, you can chain them together to achieve what you want. They even built in integration tools, like xargs (which lets you massage the unadorned text output from one program into the expected format of another). Without question, someone who understands how these tools work is more productive (with fewer headaches) than someone struggling to use a behemoth like Software Delivery Optimization. Why are the command line tools better? You can script them in nice clean ways, and let the computer do work for you. One of the unfortunate trends with graphical environments is the dumbing down of power users. If you watch how power users in the Unix world work vs. typical power users in the Windows world, the Windows guys (on average) are working a lot harder, performing a lot more repetitive tasks. We need a woodworking shop filled with simple hand tools, not more electricity and kerosene. Throw yourself a life preserver; download cygwin today. This last weekend was the No Fluff, Just Stuff Atlanta Symposium. Because he had to go back to Dallas, Dave Thomas wasn't available to do the keynote address on Friday night. So, Jay the conference organizer asked me to fill in, with a scaled down version of my Language Oriented Programming talk. I was already scheduled to do the two-part version of this talk (Part 1: Theory, Part 2: Practice) back to back on Sunday. This was turning out to be a LOP weekend! I took the theory portion of the talk and removed a lot of the hard-core technical details (no one at a keynote wants to see page after page of code, especially grammars for custom languages). The keynote went pretty well, with no major gaffes. The flow wasn't as good as I would have liked it (the talk at the time I gave it was almost 8 hours old, but it's a topic I've been talking about all year). I was afraid that everyone would be sick of this topic by the time Sunday afternoon rolled around. However, I had a good group for both parts of the talk. Several people asked me during the day if it made sense to come to the second one if they didn't come to the first, and I assured them that it was OK. The first part of the talk was up against one of Keith Donald's Spring talks, which is tough competition this year at No Fluff. The first part of the talk replicates the material in the keynote, but at a much higher level of detail. The second part of the talk is designed to be more practical. I show some interaction with JetBrains Meta-Programming System, but mostly the 2nd part encourages discussion about the viability and future of LOP. We had a great discussion, including problem domains that match LOP early adoption and what developers are already doing in this space. One of the more active attendees works for a really, really big company here in Atlanta, and he stated that LOP is currently number 4 on their list of hot technology trends to watch (no, I didn't ask what the other 3 were). He was an evangelist within his company for this evolution, so that's why he was so involved in the discussions around it all weekend. One of the best things about discussing a topic like LOP at No Fluff conferences is the number of people that you meet that are already doing this. The general level of the audience at No Fluff continues to amaze. For something new like LOP, No Fluff provides a valuable traveling road show to meet and greet the folks who represent islands of cutting edge technology (who generally are just looking for a kindred spirit for discussions). Last year, one of the attendees commented that the best thing about No Fluff is that he could talk about work and everyone around him knew what he was talking about! to talk about JavaServer Faces! A harsh plummet back to reality! My article on the Ruby Developer's Kit has just been published by the IBM Developer Works site. The RDT is not a full-blown IDE for Ruby yet, but it does have excellent support for debugging Ruby code, which is a huge win for me. I've debugged some pretty hairy Ruby code in it (including code that does automation in Windows) and have been very happy. See, I'm trying to find a way to bind the Java and Ruby communities together. Can't we all just get along? As I stated in my last post, I spent the last week at the Entwickler Conference with the Delphi crowd. One of the highlights of the conference was the technical keynote where they showed the next version of Delphi, code-named Dexter. First, a little background about Delphi. From version 1 thought 7, Delphi was written in itself. The IDE is an Object Pascal project, written using the tool itself (including the components available in the tool. This is nothing new, building a tool in itself, but it was an eloquent argument for the capabilities of the language and libraries. Starting in version 8, Borland re-wrote their IDE base, creating Galileo. Galileo was the base host IDE for both Delphi 8 and C#Builder, their competitor to Visual Studio. One of the key benefits of Delphi 1 through 7 disappeared overnight, because they had to start from scratch. Delphi 8 had a different look and a small sub-set of the capabilities of the version 7 IDE. It was slow, buggy, and had serious re-drawing issues (watching it try to launch an application caused so much flickering that it could induce seizures). This, by the way, was richly ironic to the JBuilder crowd, which had been suffering taunts about slowness and ugliness for years from the Delphi crowd. Flash forward a couple of years. C#Builder became a non-product, and was rolled into Delphi 2005, which hosted both languages. It was a little better but still only about 30% as capable of a really good IDE like IntelliJ. This has changed somewhat with Dexter. I was pretty impressed with what I saw. As a development tool, it is approximately on par with Visual Studio now in all but stability (beta testers tell me it is still pretty scary). Microsoft has the luxury of beta testing VS for 2 years; Borland cannot afford even a fraction of that. Still, the environment looks pretty good. It finally has a reasonable number of refactorings available (Delphi 2005 had 4, and from the reaction of the Delphi faithful last year, you would have thought that Borland had invented cold fusion). In my estimation, it is about 70% of a real IDE now. It is still hosted on Galileo, but it has greatly improved over the last year or so. The same IDE supports both Win32 and .NET development and has all the Borland Secret Sauce components. The next release, due out mid-next year, will even support .NET 2.0. Still not compelling enough to get anyone to consider it as an alternative to Visual Studio for new C# development (unless you are deeply immersed in Borland's Application Lifecycle Management integration strategy) but at least it isn't an embarrassment now. traditionally been the European gathering place for Delphi developers. they thought something else was better. supports .NET 2 until mid-next year. language? I still do not get it. Recently, another example popped up from an unexpected place. It turns out that there is a bug in my beloved IntelliJ and WebLogic, but only when you are doing distributed transactions and messaging. My colleague spent the better part of a day trying to resolve that little nasty bug. The snake oil hiding in the shadows here is the promise of integration sold by tool vendors. IDE’s try to encompass more and more. Visual Studio has always been successful with this (especially if you use all Microsoft technologies) without achieving a truly great code experience. Visual Studio.NET 2003 is a third world country compared the scarily intuitive IntelliJ, which is the Rolls Royce of IDEs. VS.NET 2005 is better, but still not up to IntelliJ’s standard. Borland tried to take this to the extreme conclusion with its Software Delivery Optimization suite, which tried to bind together requirements gathering, version control, coding, deployment, and monitoring into a single environment. This vision yields an awesome productivity gain as long as the integration is flawless. However, integration at that level is never flawless, meaning that you spend as much time (and considerably more frustration) trying to figure out why something that should be working isn’t, only to find out that it actually is working but the integration is obscuring the results. Some integration is good – that’s why we have integrated development environments. However, there is a fine line where vendors try to go too far and end up lessening productivity rather than enhancing it. The problem is that tool vendors are trying to create monolithic environments. I suspect that Visual Studio in all its incarnations may be the culprit here – everyone is trying to replicate that environment. Finding the fine line between integration vs. stand-alone tools is tough and going to get tougher, as vendors produce more and more immersive environments to get you to buy into their integration strategy. Someone has done this exactly right. In the next Technology Snake Oil (Drowning in Tools), I’ll talk about that. I wrote recently about Prescriptive Approaches in the Small. More pervasive and dangerous, though, are Prescriptive Approaches in the Large. Everyone wants a repeatable pattern, a guaranteed way of doing things. Recently, at No Fluff, Just Stuff Columbus, OH, one of the questions for the expert panel was: “Our company is looking for a road map, a sure-fire prescription of what technologies, methodologies, and approaches we should take – can you provide this?” Uhhhh, no. Most of the panelists nearly crawled out of their skin to get in line to answer this question (I thought Prag Dave was going to have a heart attack – if you know him, you know this is anathema to him!). There is no prescription for software development done right in your company – every place is different. You cannot come out and say that this approach (whatever it is) is right in every circumstance. Following this line of reasoning, I think that the PetStore was one of the worst evils inflicted on the young, innocent, fawnlike Java Enterprise Edition. It was supposed to be a catalog – “Look, here are all the things this shiny new technology can do” – and people took it as a prescription. Rather than sit back and determine for what EJB was suitable, developers dove right into using them in their projects because the prescription said so. EJB was (and is) suitable for only very specialized types of applications. If you were writing a real pet store application (even back when PetStore came out), you would be crazy to use EJB! The pattern repeats over and over, with technology (“Everyone is using Struts, so we should be too”) to methodologies to products. You can bet that the SOA vendors are salivating over the prospect of creating the prescription that says “Everything must be decoupled, document centric messages – here, we have an expensive product that just happens to do this!” As much as it hurts, you have to make determinations for yourself on which technology (methodology, framework, tools, etc.) are best for the situation you are in right now. There is no prescription, no matter what ersatz technology doctors tell you. As I worked through the screens that would be needed to allow either party to initiate the process, I realized that Aardvark would be just as useful, and radically simpler, if the helper was required to start the whole process. Making this change in the spec took an hour or two. If we had made this change in code, it would have added weeks to the schedule. I can’t tell you how strongly I believe in Big Design Up Front, which the proponents of Extreme Programming consider anathema. I have consistently saved time and made better products by using BDUF and I’m proud to use it, no matter what the XP fanatics claim. They’re just wrong on this point and I can’t be any clearer than that. Joel has an interesting perspective on this subject and has written quite eloquently on this and other topics (I highly recommend his books and blog). However, I think he’s just wrong about this. He has a skewed view on software development, having worked at product companies his whole career. Building products is a lot different from building business applications (which is where my experience lies). First, for products, the requirements and design are pretty much made up of a few people’s vision on what the product needs to do. The market place determines if they were right or not. Second, you generally have to do this in secret, especially if you have competitors who will cherry pick your design. Third, you are pretty much required to do a “big bang” deployment, when you ship to customers. Most business applications aren’t like this. The requirements are very fluid (quite often, the business stakeholders don’t know what they want even well into the process). When done correctly, the process is collaborative across business units and developers, making for a stronger product. Last, you can roll out iterations (even if just to QA and/or acceptance testing) without the big bang. Joel is using the straw man arguments against XP. Many misinformed naysayers against XP assume that we never think about what we’re doing up front. Of course we do. This same group assumes that there is no coherent architecture for complex XP projects. Just because we’re doing agile development doesn’t mean that we just sit down and hack out code with no planning or forethought. Believe me – I’ve had lots of experience building business software, and Big Design Up Front just plain doesn’t’ work, even when it is done well (I’m fighting it yet again even as we speak). XP delivers better quality software, in shorter times, closer to the ultimate target, which has a fighting chance of actually usefulness. Taking this topic to the logical conclusion, I wonder what would happen if a product company did a full-on agile approach? Building the product based on custom feedback from the early iterations. You would need a patient customer base, willing to comment on the work in progress. I can’t help but believe that, just as in the business software world, you would end up with a better product. How many features could you eliminate in something like Word if it had been developed incrementally? So much useless cruft could be removed from commercial software if product teams listened to their customers while developing the software rather than the complaints after it is done. Some companies are tiptoeing in this direction. Check out JetBrains Early Access Program for innovative tools like Fabrique and MPS (The Meta Programming System). I think these products will be extraordinary if they can get their target audience to give them feedback. Agile product development – what a concept! I'm an Apache Committer who is still on the way of studying English. I'm trying to level-up my English skill translating great blog entries from great authors. I think that's more than a bit generous, but I'm gladly supporting this effort because, hey, it isn't costing me anything and it spreads my meaningless opinions all over the world. What an unbeatable combination. Seriously, I appreciate the hard work Trusten is doing for this, and I hope that my dribbly writing is worth translating. Now, I’m really interested to see if he translates this blog entry, creating a kind of recursive blog referencing stack overflow. The world is a much simpler place if you can just coast through it, without having to expend precious mental energy. In fact, it seems widely encouraged in many organizations: if we can prevent our employees from thinking too much, they will stay out of trouble. Unfortunately, to build insanely great software requires thought on many different levels, which doesn’t go well with prescriptive approaches. You see all sorts of prescriptive approaches in software development, both large and small (this entry covers small, the next Snake Oil piece covers large). Small prescriptive manna floats down in many different guises, mostly in a good context like design patterns and best practices. Many developers take these nuggets out of context and start believing that this Prescription for building all types of things represents the One True Way (without bothering to apply additional thought). Don’t think that I’m denigrating design patterns – they are clearly a good thing, as a way to catalog common patterns. The problem comes in when they are used without thinking. Here is a classic example that appears all over the Java code I see every day. Java doesn’t really have a struct-type thing, which is just a holder for data. In Java, everything is a class, which is OK. Nevertheless, I see developers who just need to pass composite data around creating a Java class with accessors and mutators that won’t every be used for encapsulation. It has become a common prescriptive practice in Java to create the class, create private member variables, and generate getters and setters for them without remembering why you create accessors and mutators. If this class is never going to have any behavior attached to it, if it is a simple container for information, you don’t need the accessor/mutator pair or the private scoping – make them public. If you really need to add behavior later and/or encapsulation, you can refactor the class into a real class, not just a composite data type. The real sermon here is to think about why you create things, don’t just blindly create artifacts. Yes, encapsulation is generally a good thing, but isn’t required in every single thing that looks like a class – sometimes it’s really just a struct. You must always be diligent about why you are creating what you create. I was almost voted off the island recently. Because of some scheduling issues involving me rolling off a project, another one starting, and the slated person still a week away of rolling of his project, I was in the unfortunate position of going to a client's site for just 1 week, at the start of a new project. The first day, I arrived late because of travel details, and we spent the day going over the technical details of what it was we were going to be doing. All fine and good. In fact, one of the overviewers was kind enough to identify something he thought I could do in just a week, something orthogonal to the rest of the work. The next day I get to work and the client supervisor asked me into his office. "Neal, we just don't think the one week thing is going to do us any good, we like you and all, but you should just go ahead and leave." He was trying to kick me off the island! The last thing he said was "Unless you can think of a good reason we should keep you..." That was my chance. I said "Well, of course, it is your decision, but I have found something I can get done in a week", and went on to tell him about the one-off sub-project we had identified the day before in technical detail. He listened to my case, then called the technical lead into his office and had me repeat it. The tech lead said "Well, we do need that piece, and I think he can get it done in a week". The supervisor turned to me and said "Alright, get back in your office and get to work!". Saved! And it turns out that I was able to get the work done in a week, and the client requested that I stay on instead of the guy originally slated for the gig. How is that for defending your life? The beauty of this is that any reasonable modern browser will automagically apply this stylesheet anytime you double-click on the XML file. This is the ultimate form of documentation -- generated directly from the source in real time. 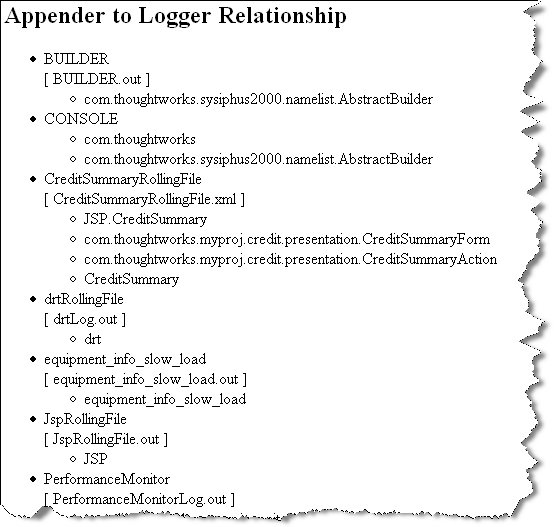 Any changes to the relationships in the logger.xml document are instantly shown when you look at the file. If you still want to see the raw XML, you right-click and "Open With..." instead. This makes the browser view of the XML document useful without hiding or obscuring the functional elements. And is a good example of the DRY principle (Don't Repeat Yourself) from the Pragmatic Programming applied to documentation. Model Driven Architecture (or "Cartoons to Code") is the ultimate culmination of the vision of UML. Let's draw the software with diagrams, including decorations to represent logic, then click a button to generate the code. A laudable goal, but far short of reality. The only real success stories with MDA are for very limited problem domains, like embedded software. Here's why: consider the cash register at McDonalds. The number of items is very limited, and the number of things you can do with them are very limited. This is well suited to a pictorial (in fact, an ideogrammatic) representation. That's because the concepts on display are retricted to morphemes, which in linguistic terms represents the smallest language unit that carries a semantic interpretation. Thus, it's easy to create a McDonalds cash register using just pictures and make it a quite effective solution to the food ordering problem. For complex problems, you can't break down the problem to simple morphemes -- imagine the semantic complexities of a concept like "loan" or "payment". For a problem domain this rich, you need the richer representation of a full-blown language (which the Egyptians also discovered -- they were the last MDA success story, and they eventually abandoned it!). Trying to cram rich semantics into a pictorial representation so that you can create software that abstracts those semantics is absurd. In fact, trying to cram the entire world into a strict tree-shaped hierarchy isn't much better (see Programming, Object-oriented). At least OOP has more flexible semantics, and we keep forcing solutions to this hierarchy problem with inventions like aspects, which cut across the tree-shaped world we've created (because stuff in the real world cuts across trees). So, where do we go from here? Let's solve it the same way mankind (including the Egyptians) did -- create language! Language is ultimately the only way to handle the rich semantics of the world around us because that's what the people stating the problem domain use to state the problem. Which is why I'm so geeked about Language Oriented Programming -- building domain specific languages that are as close as possible to the problem we're trying to solve. LOP done right encapsulates the low-level details of a language like Java, allowing developers and others to work at a higher level of abstraction. We've been mired in curly-brace languages too long -- we need to upgrade our abstraction. MDA is the wrong direction for abstraction upgrade. It tries to further restrict our expressiveness, believing that the entire world can be graphed and you can create real software this way. Imagine for a moment the MDA diagrams (including Object Constraint Logic) for your average J2EE enterprise application. You can build it in code, with the crude semantics of curly-brace Java in 1/3 the time you could model it to the point where you can click the "And Then a Miracle Occurs" button to generate the application. MDA might work for simple, semantically unique domains, but no where near the real world. Recently, I did a 3-hour tutorial workshop at the SOA conference in Singapore entitled "Agile Development and SOA", where I talked about aspects of Agile development as it applies to SOA type projects. Mostly, it was an excuse to talk about Agility in a foreign land. I asked a few more, but you get the gist. She thought they were very happy with SDLC because they didn't know that something better existed. Perfect crowd for an agility talk, right? It was an uphill battle. No one could believe that this crazy idea could ever work -- waste all that time writing tests? Include the users as part of the development team? Pair Program?!? That cuts your productivity in half! Sigh. I waged a good battle, but don't know how well the war is going. At the end of the talk, I had either convinced them to tip-toe towards Agility (because these were developers -- can you imagine what their boss will say?) or they were just tired of me talking about it and said anything to get me to shut up. I've blogged about this phenomenon before -- why is it that developers and managers believe that all forward progress in methodology stopped in the mid-70's and all language development froze about the time Objects appeared? Is it just a non-technical person's fatigue at trying to keep up, so an arbitrary milestone was created beyond which "I won't think about it anymore?" Are developers so overwhelmed that they just shut down too, and keep working on what's in front of them even though better things abound? Back in the mid-nineties, Rapid Application Development was the answer to all developer woes. RAD tools came out in droves and everyone touted the huge productivity gains made available by drag and drop user interface design and component based development. RAD environments made for great demo-ware -- you could stand in front of a group of Pointy Haired Boss types and build a working application right before their eyes while you were talking about it (I know because I did some of this -- and I still have trouble sleeping sometimes). Of course, the message was clear: buy This Tool, and you too can have developers that can point and click their way to huge productivity gains. And bought it they did. Then a funny thing happened to the developers on the way to this astounding productivity. They learned the tools and dutifully dragged and dropped their way to building applications...and it was good. Until, that is, they figured out that building the application is the short, easy part -- now they have to maintain the monstrosity they've created. RAD development doesn't scale well, and when you build large and very large applications with it, maintaining those applications is a nightmare of searching for the scattered crumbs of code scattered hither and yon. Working for a while in this environment is what made the Design Patterns book really hit home -- the kind of code we were creating was entirely anti-pattern, and more about "how fast can it be created"? The maintenance nightmares led me, as CTO of a consulting and development company, to figure out new ways to use the RAD tools we had to use (because of our clients) that did follow good design principles. What we found is that the tools fight you when you try to do the right thing. RAD Development tools have a path of least resistance, which makes things very easy while you stay on the path (and use their wizards and other support structures). Stray from the path, and you find obstacles at every turn. But, it's worth fighting through them to get to a place where you can create maintainable code -- and you find that you are no longer doing Rapid Application Development, just Application Development. RAD is now rightfully deprecated in most serious software development efforts. Even serious developers using RADish tools like Visual Studio are avoiding the RAD pitfalls. Some developers still fight with RAD tools, and think that maintenance is just always extremely difficult in big projects. I'm still shocked by the developers who have still never heard of Design Patterns and who still work on Sisyphean development chores. Which is why I think the RAD aspect of Ruby on Rails misses the point of what makes Rails interesting. RAD doesn't work for large, complex projects, no matter what technology. The interesting part of Ruby on Rails is the effective use of Ruby to build a domain specific language on top of the underlying Ruby language that makes it easier to do web applications with persistence. It is more advanced than the RAD tools of old because you can drop to the underlying Ruby language and get underneath the framework when you must -- and that's a powerful idea. But, building complex applications in it still requires real thought. Maybe the breathless amazement of the Rails community reflects the absence of effective RAD tools in this space before. Don't get me wrong -- I think that Rails is cool, just not for the reasons touted by so many Rails-flavored Kool-aid carriers. I was told by someone recently at ThoughtWorks that I was so old that I "added to the company's diversity". Well, I've decided to take this sage old-timers wisdom and put it to some good use. In the development world, we keep getting sold Snake Oil in one guise or another, and I'm going to start pointing out some snake oil. Starting with the most venerated of crappy technology: UML. Some of us craggy old-timers remember the time before UML, when we had Booch, Rumbaugh, and several other competing diagramming notations. The Holy Grail was going to be the Unified Modeling Language, which would solve all our problems and finally give us software developers a universal language, for everything from use cases through structure to deployment. And that's what we got. A classic example of "be careful what you ask for". UML feels like a compromise between a group of people, and it's so general that it's almost useless. The standards bodies keep bolting on new stuff to try to get it to the point of basic usefulness, but it just makes it worse. Does anyone really use Object Constraint Language to decorate their diagrams so that they can generate code that Just Works? I have never seen a case where you couldn't get it done faster by writing the code, then reverse engineering it into one of the expensive tools. Of course, it's good to design things before you code them, but a white board is much better. Combine the nature of UML with the fact that you can't ever show its diagrams to business analysts or end users because it is too obtuse, and I end up doing most of my architecture and design work in Visio (and I'm no fan of it either). It creates diagrams you can show everyone that capture the essence of what you are doing just before you implement it. While talking to some of the other speakers at the SOA conference in Singapore, it occurred to me that SOA has an interesting side effect that has nothing to do with technology. To make SOA really work, a business has to strictly define what it is they do, to the point that a developer can create services to represent it. That's the rub -- most businesses don't understand their own business to that level of detail. Time and time again, I've noticed that the analysts and developers on a project actually define a client's business processes to a much finer level of detail than the business ever has. To write code for something, you have to really understand it. Some of the clients for which I've worked even commented on the fact that, because of the development process, they understand their business better. Of course, the opposite is also true (and, alas, more likely) -- companies with poorly defined business processes will try to adapt SOA and fail miserably, creating a case study of SOA failure, when the technology had nothing to do with it. Worse yet, tool vendors of expensive development tools like Enterprise Service Buses will sell their tools to unsuspecting clients as a way to "fix" their business process. Putting a dress on a pig doesn't make the pig any prettier, and it just annoys the pig. SOA, like so many other similar technological breakthroughs (see Programming, Object-oriented and Development, Component-based), won't solve the dysfunction of dysfunctional businesses. In both trips this year to Singapore, I had the eerie sense of sticking out like a sore thumb -- I was conspicuously Not From Around Here. In most of the other places I've traveled, I could, with a little effort, blend in with the natives. In Europe or Australia, if I dress like the natives, I look like a native. Of course, as soon as I open my mouth, I'm a goner, but I can quietly blend. Not in Singapore! I am obviously not from the neighborhood. I don't mind being different (I certainly was in high school, and I was from the neighborhood). However, in Singapore, I'm a target for all sorts of commerce attempts. I can't walk past a store front, even in the tony parts of town, without someone trying to sell me something. I'm not only conspicuously Caucasian, I'm American, and therefore both gullible and rich! I can't get the locals price around here for anything. Just another example of how travel broadens you, and why I like travel so much because it provides perspective. Back in the dim and distant past, I blogged about desktop search in general and Google Desktop Search specifically. In that post, I lamented the search tools of yore that went away for one reason or another. A commenter kindly pointed out that my all time favorite (Magellan) now lives on as X1.. Lo and behold, Yahoo has entered the fray with their own desktop search tool, based on X1. In fact, it is a free version of X1 that doesn't include the enterprise features. It has a slick Windows-based UI and does a lot of cool tricks. So, I displaced Google and installed Yahoo Desktop Search (PCMagazine also gave it their editor's choice). Well, after using it for a while, I'm un-installing it and going back to Google. Both are in beta, but Google is much more stable IMO. Yahoo was constantly doing odd things, and seemed to be belly up when I needed it the most. While Google has a sparser UI and doesn't handle as many file types, it is (at least for now, for me) more stable. And, for infrastructure software like desktop search, stable wins the day for me. I'm writing this while un-installing Yahoo and re-installing Google. Maybe once Yahoo turns 1.0, I'll re-evaluate. But for now, I'm switching back to Google. Life is too short to spend time on activities where our passion is not engaged. I know a lot of people who fundamentally don't enjoy their work. While earning a living is a laudable goal, I think those of us who do really enjoy their work are lucky. Most of my friends who don't enjoy their work envy the passion with which I attack my work. Some of them accuse me of not really working, just enjoying my hobby: that's not true -- it's still work. For my hobby, I would create an entirely different set of software. It still tires me out at the end of the day. But, for the most part, I take joy in the job that I do. I'm lucky. I was reminded again today by a fellow ThoughtWorker why in Java it's a good idea to write the test, run it to watch the test fail, then make it pass: what if you mis-spell the testing method, i.e., "tsetMyMethodToSeeWhatItDoes()"? Because JUnit uses reflection to find the methods to run as tests, it won't pick up "tset". Which is why I think that NUnit v2 got it righter (is that a word?) by using annotations to mark the test methods instead of naming patterns. If you misspell the annotation, the compiler complains, which, in this case, is A Good Thing. Improvements are already afoot in the Java world -- TestNG already supports annotations (and JavaDoc tags if you are using 1.4) and several other features, and rumor has it that JUnit 4 will support annotations and some of the other TestNG features as well. One of the questions that frequently comes up during the expert panels at No Fluff, Just Stuff is "What Comes Next?" What, in the opinion of the speakers, is the Next Big Thing? Consequently, I think about this probably more than most developers just so that I'll have a lucid answer at these panels. One of my favorite characteristics of college was the accidental synergy that occurs between classes that you happen to be taking in the same quarter. For example, I took the automata class the same quarter as the compilers class, and there are obvious common elements. Even something as seemingly unrelated as artificial intelligence and philosophy creates a fertile ground for interactions. It is a complete version of the sample (including all the supporting files to make it run + IntelliJ project file). Martin graciously gave me permission to post it on my website and in my blog. Language oriented programming looks to me like the next big revolution in programming paradigms, and I'm spending a lot of time playing with this right now. Recently, I had the privilege to see a unique performance of Alban Berg's Chamber Concerto by members of the Chicago Symphony Orchestra, lead by Pierre Boulez, with Daniel Barenboim on piano and Pinchas Zukerman on violin. This concert was special because it re-created a landmark recording of this work by the same ensemble. The other unique thing about this concert: the musical work is only about 30 minutes long, but it was the only piece of the evening. Mr. Boulez and the entire ensemble came out and discussed the work (with examples) for 1 hour, 40 minutes, then took a short intermission, then played the work. What makes this music so interesting that you can talk about it for 3 times as long as the piece itself? Well, it would take me over an hour to explain! Here are some examples, though. This piece was written in homage to Berg's teacher, Arnold Schonberg, who developed the 12-tone method of composition. The first theme of Berg's work represents Schonberg, Berg, and Anton Webern (another student) with the motif Arnold Schonberg Anton Webern Alban Berg (using the German alphabet). So, the main theme of the work uses the names of the teacher and students. Another example: the second movement is a palindrome: it plays up to the middle (signified by the piano's only involvement in the 2nd movement) the plays in reverse to the end, using different combinations of instruments so that it's not immediately obvious. There are lots of mathematical features in this music: the first two movements have 240 bars each, and the third has 480 bars. Needless to say, this is a fascinating piece of music, made all the richer if you understand the context of the time in which it was written and all the ideas that went into it. Many people who don't like modern serious music don't have the correct expectations or context. Just as the movie Memento is different than Casablanca, they are both great achievements. The same is true for serious music. One of my biggest treats of No Fluff, Just Stuff symposia is the conversations you get into before and after. On the way to the airport in Orlando, Glenn Vanderberg, David Bock, and I shared a crowded airport shuttle (with a bunch of vacationers who didn't share our conversation). Glenn talked about some fascinating writing he's doing with feedback loops in Extreme Programming and David talked about the Agility Index Measurement. My contribution? A interested but dazed stare. David has since blogged about AIM (nice acronym, very managerial) here. He's soliciting for people to help him develop a more or less objective measurement of just how agile a team really is. To quote: "the point is I WANT A WAY to compare the capabilities of teams implementing these [agile] processes." If this topic interests you, wander over to his blog and put your own $0.02 for what categories should be measured. One of the early histories of Saturday Night Live talked about the first meeting of the writers. Even though they had never met one another, and were from different parts of the country, they had a common language and thought that the same kind of things were funny. It was compared to jazz musicians, who can jam with one another even if they've never met, because they share the same vocabulary (and, dare I say, are familiar with the same problem domain). The same thing happened last weekend at No Fluff, Just Stuff in Orlando. One of the speakers became ill at the last minute, and the organizer had to scramble to find speakers to fill his spots. I filled one of the talks, about fallicies in enterprise architecture, after never having seen the talk and having a whole 10 minutes to look at the slides for the first time. However, the talk came off really well -- I managed to talk for the entire ninety minutes, and got good scores. Because the problem domain was familiar, I was able to extemporize the talk, bringing my own experience to bear. This talk wasn't about tools or APIs, but about common fallacies developers face in enterprise situations. Well, I've seen a lot of that. Of course, I'm sure my rendering of the talk is no where nearly as good as the original and that the stories and experiences I bring are completely different from the original speaker. However, it reminded me of a jazz trumpet player showing up to a gig and saying "'Girl from Ipanema', extra solo after the chorus, and watch me for the finish. A-one, and-a Two, and...". If you subscribe to Martin Fowler's blog, you've probably already read about Language Oriented Programming and Language Workbenches. He has very nicely encapsulated and clarified some of what I've been thinking for a while and added some badly needed organization to the topic. I've been doing a No Fluff, Just Stuff talk this year about Building Domain Languages atop Java, and it has been received very well in the cities I've where I've given it. Now, I'm about to revamp it and make it a Language Oriented Programming talk instead, taking the material I already have and adding discussions about LOP in general and workbenches. I'll also start showing JetBrain's (the makers of IntelliJ) cool new MPS meta-programming tool. It's still rough around the edges, but still very interesting. You have to have the early access version of IntelliJ (code named Iridia) and the MPS plug-in, but you can download all these goodies at JetBrains' site. As further proof that I embrace all IDE's (besides my beloved IntelliJ), I have just published an article on IBM developerWorks site about building centralized help in Eclipse. One of the really cool things about Eclipse is that everything important, including the help system, is built as a plug-in. This article shows how you can externalize both the built-in help and help you download with plug-ins into a central place. You can also turn the Eclipse help into a kind of wiki or other kind of collaborative document management tool without too much effort. The help system is quite flexible, as this article shows. Blogs are a great way to show what you know and also a great way to show what you don't know (and can learn). I blogged yesterday about how to chain 2 ant calls together via Bash. Several comments showed that there is definitely more than one way to do this. You can use the "&&" in Windows to chain commands (which I had seen in the past and promptly forgotten). This also works in Cygwin's Bash because most of the stuff that works in the Windows command prompt also works there (Reason #432 to use Bash). However, I didn't know that you can chain targets together on the command line for Ant! I've been using Ant since early 2001 (I know the time frame because I wrote the first Ant article for Java Developer's Journal in June of 2001), but I didn't know about this handy-dandy little trick. This illustrates, to me, one of the best reasons to have a public forum like a blog. You inadvertently learn all sorts of stuff if you are brave enough to try to teach others what you already know -- including stuff that you didn't know that you didn't know. This runs the default ant task (which builds everything). If the return code is 0, it then runs the "runatest" target. The test runs only if the build was successful. This little trick takes advantage of the fact that ant is smart enough to tell the underlying OS (regardless of the shell) if it passed or failed. The "fi" at the end is the "end if" indicator for bash. Yes, you can create the same kind of little batchy kind of thing in Windows, but I never think to. It seems somehow more natural to me to think in terms of automation, shell scripts, and command chaining in bash than it does Windows. Maybe it's because bash is far, far more powerful than the command line tools in Windows. I never run anything in a Windows command shell now that I unless I'm forced. When talking to the natives in Singapore, I and a friend (Terry) heard about Durian ("Stinky fruit"), which is a local fruit. I always ask about local foods from the natives to see what I can try that I haven't had before. 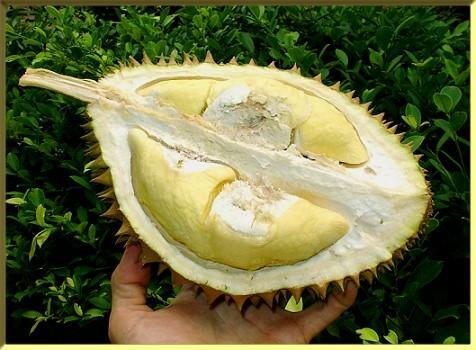 It is against the law in Singapore to take a durian on public transport. And it is forbidden to take the fruit inside most buildings. However, several locals at the table said they really liked it. My new mission: try some durian. We ate one night at Newton food court, which had fresh durian, so we got one. Tom, who lives in Bali , is a big fan, so he would eat it if we didn't care for it. Well, they cut it open and Tom insisted that we eat it essentially holding our nose -- the flavor and the smell are only loosely related. So I tried it. Frank said it best -- it's like a mixture of vanilla pudding and onion, with a kind of fruit-flesh/fishy texture. I tried it. It was durian-like. OK, I've tried it. The problem is that, even though I only had a bite, I kept trying it -- the taste would not go away. I ate some other stuff. Still there. Drink water, beer, whatever -- durian. After a while you can sort of get rid of the taste until you have the misfortune of burping. Durian. Stronger than ever. It keeps growing. It was well into the next day until I could taste something else. It took Terry even longer. In fact, he developed a semi-permanent association between Tiger beer and durian taste. He may never appreciate Tiger beer again. The other interesting aspect of this fruit: it smells. And it gets stronger and stronger. It was still at our table because Tom (for whom I have new respect mingled with pity) was gradually eating the leftover durian (all the durian except for one bite each from the other victims). Ingo (one of the speakers) kept asking Tom to move it further away, because the smell, while not exactly the same as the taste, is the olfactory equivalent of the taste. After you have smelled it, you smell it everywhere. For the rest of the trip, we could tell anytime we got close to durian. Terry and I would look at each other at the same time: durian. Every open air market you come to sells that stinky stuff. And you always notice it if it's near. You have been warned.